Marshal of France (French: Maréchal de France, plural Maréchaux de France) is a French military distinction, rather than a military rank, that is awarded to generals for exceptional achievements. The title has been awarded since 1185, though briefly abolished (1793–1804) and briefly dormant (1870–1916). 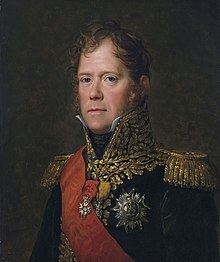 It was one of the Great Officers of the Crown of France during the Ancien Régime and Bourbon Restoration, and one of the Grand Dignitaries of the Empire during the First French Empire (when the title was Marshal of the Empire, not Marshal of France). A Marshal of France displays seven stars on each shoulder strap. A marshal also receives a baton: a blue cylinder with stars, formerly fleurs-de-lis during the monarchy and eagles during the First French Empire. The baton bears the Latin inscription of Terror belli, decus pacis, which means "terror in war, ornament in peace". Between the end of the 16th century and the middle of the 19th century, six Marshals of France were given the even more exalted rank of Marshal General of France: Biron, Lesdiguières, Turenne, Villars, Saxe, and Soult. The title derived from the office of marescallus Franciae created by King Philip II Augustus of France for Albéric Clément (circa 1190). The title was abolished by the National Convention in 1793. It was restored as Marshal of the Empire during the First French Empire by Napoleon I, and the title was given to Jean Baptiste Jules Bernadotte, sovereign Prince of Pontecorvo and later King of Sweden. Under the Bourbon Restoration, the title reverted to Marshal of France, and Napoléon III kept that designation. After the fall of Napoleon III and the Second French Empire, the Third Republic did not use the title until the First World War, when it was recreated as a military distinction and not a rank. Contrarily to ranks, which are awarded by the army, the distinction of Marshal of France is awarded by a special law voted by the French Parliament. For this reason, it is impossible to demote a Marshal. The most famous case is Philippe Pétain, who was awarded the distinction of Marshal of France for his generalship in World War I, and who was stripped of other positions and titles after his trial for high treason due to his involvement with collaborationist Vichy France: due to the principle of separation of powers, the court that judged him did not have the power to cancel the law that had made him a Marshal in the first place. The last living Marshal of France was Alphonse Juin, promoted in 1952, who died in 1967. The latest Marshal of France was Marie Pierre Kœnig, who was made a Marshal posthumously in 1984. Today, the title of Marshal of France can only be granted to a general officer who fought victoriously in war-time. Henri de La Tour d'Auvergne, Vicomte de Turenne, Duc de Bouillon (1555–1623), Marshal of France in 1592. Charles de Gontaut, Duc de Biron (1562–1602), Marshal of France in 1594. Claude de La Chatre, Baron de la Maisonfort (1536–1614), Marshal of France in 1594. Jean de Montluc de Balagny (1560–1603), Marshal of France in 1594. Jean III de Baumanoir, Marquis of Lavardin and Count of Nègrepelisse (1551–1614), Marshal of France in 1595. Henri, Duke of Joyeuse (1567–1608), Marshal of France in 1595. Urbain de Montmorency-Laval, Marquis of Sablé (1557–1629), Marshal of France in 1595. Alphonse d'Ornano (1548–1610), Marshal of France in 1597. Guillaume de Hautemer, Count of Grancey (1537–1613), Marshal of France in 1597. François de Bonne, Duke of Lesdiguières (1543–1626), Marshal of France in 1608. Concino Concini, Marquis of Ancre (1575–1617), Marshal of France in 1613. Gilles de Courtenvaux, Marquis of Souvré (1540–1626), Marshal of France in 1614. Antoine, Baron de Roquelaure (1560–1625), Marshal of France in 1614. Louis de La Châtre, Baron de Maisonfort (died 1630), Marshal of France in 1616. Pons de Lauzières-Thémines-Cardaillac, Marquis of Thémines (1553–1627), Marshal of France in 1616. Jean François de La Guiche, Count of La Palice (1569–1632), Marshal of France in 1619. Honoré d'Albert d'Ailly, Duke of Chaulnes (1581–1649), Marshal of France in 1620. François d'Esparbes de Lussan, Viscount of Aubeterre (died 1628), Marshal of France in 1620. Charles de Créquy, Prince of Poix, Duke of Lesdiguières (1580–1638), Marshal of France in 1621. Jacques Nompar de Caumont, Duke of La Force(1558–1652), Marshal of France in 1621. François, Marquis of Bassompierre (1579–1646), Marshal of France in 1622. Gaspard de Coligny, Duke of Châtillon (1584–1646), Marshal of France in 1622. Henri de Schomberg (1574–1632), Marshal of France in 1625. François Annibal, Duc d'Estrées (1573–1670), Marshal of France in 1626. Timoléon d'Epinay de Saint-Luc (1580–1644), Marshal of France in 1627. Louis de Marillac, Count of Beaumont-le-Roger (1572–1632), Marshal of France in 1629. Henri II, Duke of Montmorency and of Damville, also Admiral of France (1595–1632), Marshal of France in 1630. Jean Caylar d'Anduze de Saint-Bonnet, Marquis of Toiras (1585–1636), Marshal of France in 1630. Antoine Coëffier de Ruzé d'Effiat (1581–1632), Marshal of France in 1631. Urbain de Maillé, Marquis of Brézé (1597–1650), Marshal of France in 1633. Maximilien de Béthune, Duke of Sully (1560–1641), Marshal of France in 1634. Charles de Schomberg, Duke of Halluin (1601–1656), Marshal of France in 1637. Charles de La Porte, Marquis of Meilleraye (1602–1664), Marshal of France in 1639. Antoine III, Duke of Gramont (1604–1678), Marshal of France in 1641. Jean-Baptiste Budes, Count of Guébriant (1602–1643), Marshal of France in 1642. Philippe de La Mothe-Houdancourt, Duke of Cardona (1605–1657), Marshal of France in 1642. François de L'Hôpital, Count of Rosnay (1583–1660), Marshal of France in 1643. Henri de la Tour d'Auvergne, Vicomte de Turenne (1611–1675), Marshal of France in 1643, Marshal General of France in 1660. Jean, Count of Gassion, (1609–1647), Marshal of France in 1643. Alberico III Cybo-Malaspina, Duke of Massa (1674–1715), Marshal of France in 1703. The names of many of these have been given to successive stretches of an avenue encircling Paris, which has thus been nicknamed the Boulevards des Maréchaux (Boulevards of the Marshals). ^ Steven Runciman, The Sicilian Vespers: A History of the Mediterranean World in the Later Thirteenth Century, (Cambridge University Press, 2000), 93. ^ Frederic J. Baumgartner, Henry II: King of France 1547–1559, (Duke University Press, 1988), 56. ^ Encyclopædia Britannica, Vol 23, Ed. Hugh Chisholm, (1911), 719.